The Dakine Thrillium Bike Short is thanks to the ventilation holes on the inside leg, comfortable to wear on the front and on the back, even on hot days. The loose, lightweight trousers is cut a little, so that the protectors find space underneath. The elastic four-way stretch fabric, this high-quality cycling shorts wearing roomy comfort does not cut a mountain biking. 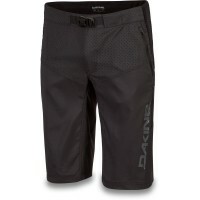 The comfortable allround pants by Dakine is also suitable for hiking. Customer evaluation for "Dakine Thrillium Bike Short Electric Mint"